Comments As fast acting as and powerful as Blue Sapphire, a Madagascar Iolite of this Bluish Violet shade is much sought after! When clarity levels are as exceptional as this gem, very good results are a foregone conclusion! 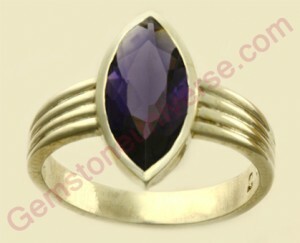 Set in this sterling silver ring this is a potent Saturn / Shani talisman!